PriceLabs is an innovative revenue management solution that aims to simplify all the tasks involved in handling vacation rentals. Equipped with predictive analytics and machine learning, this tool allows users to maximize profits by determining the best possible rental price for their property based on demand and supply trends. The dynamic pricing features allow the vacation rentals to manage stay restrictions as well as the revenues through its simple dashboard. One can expect features of property management and integrations that would make it a perfect automated revenue management and pricing customization software. PriceLabs have high-performing revenue management tools that make it easier and quicker for vacation rentals to set pricing. 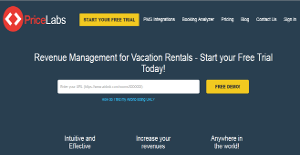 It integrates the automation and customization options to help the vacation rentals to increase their revenues and save the time consumption. The balancing of demand and supply using the booking analyzer helps set pricing that is both market and customer oriented, therefore allowing for more customized plans and offers. This is made possible through the data-driven features which help collect data regarding the trends, past performance and future forecasts of demand and supply and holiday estimations. The software also allows for pricing and minimum stay customization, if you don’t find the recommended pricing suitable to your plans. For customized pricing, minimum and maximum ranges are used along with the minimum stay rules and dates. More customization can also be attained through this feature of PriceLabs until you get satisfied by the offer. Its dashboard is designed to help manage portfolios of any kind, at the same time. One can see how each portfolio is performing and can see which listing needs an upgrading with regards to pricing or customization. These listings can be filtered using the rules applied to the account as per their levels. If you are interested in PriceLabs it could also be a good idea to check out other subcategories of Best Hotel Management Software collected in our database of SaaS software reviews. Each organization has different wants and needs an application that can be personalized for their size, kind of workers and clients, and the particular industry they are in. For these reasons, no system can proffer perfect features off-the-shelf. When you search a software system, first be sure what you want it for. Read some PriceLabs reviews and ask yourself do you want basic tools or do you require sophisticated tools? Are there any industry-specific features that you are seeking? Get the answers to these queries to assist your search. There are lots of elements that you need to consider and these include your finances, particular business needs, your organization size, integration needs etc. Take your time, try out a few free trials, and finally select the platform that presents all that you require to boost your organization efficiency and productivity. How Much Does PriceLabs Cost? PriceLabs offers enterprise pricing packages that are bundled based on the number of properties you expect to manage on a monthly basis. To get a better feel of what this software has to offer, you may register for their 30-day free trial. All plans are inclusive of 1 channel connection (additional channel connections can be added for $1 per property). You can also find a formula calculator embedded on the company’s website to check your price. We realize that when you make a decision to buy Hotel Management Software it’s important not only to see how experts evaluate it in their reviews, but also to find out if the real people and companies that buy it are actually satisfied with the product. That’s why we’ve created our behavior-based Customer Satisfaction Algorithm™ that gathers customer reviews, comments and PriceLabs reviews across a wide range of social media sites. The data is then presented in an easy to digest form showing how many people had positive and negative experience with PriceLabs. With that information at hand you should be equipped to make an informed buying decision that you won’t regret. What are PriceLabs pricing details? What integrations are available for PriceLabs? If you need more information about PriceLabs or you simply have a question let us know what you need and we’ll forward your request directly to the vendor.